DM-MD6X1 Switcher is perfect for small to medium sized rooms, providing a versatile combination of digital, analog, and DM CAT inputs and outputs. The DM-MD6X1 delivers an incredibly versatile and cost-effective solution for managing a complete range of digital and analog AV sources in a small conference room or classroom, or as part of a larger DigitalMedia distribution system. 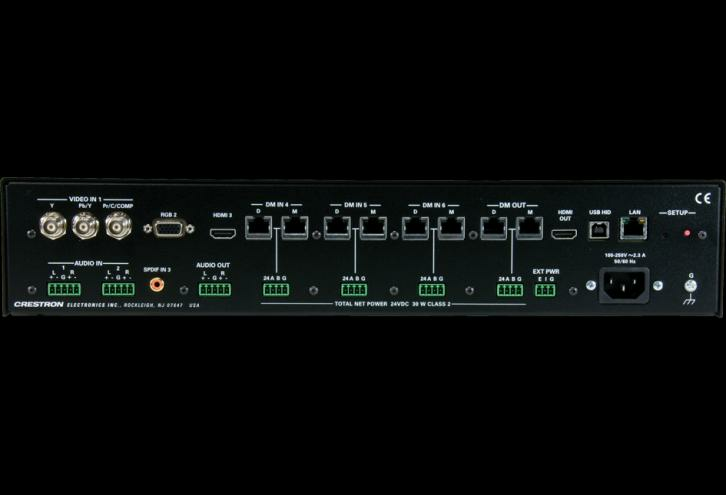 High-resolution computer signals, standard and high-definition video, stereo analog and digital multi-channel audio sources are all handled by the DM-MD6X1, providing a perfect standalone switcher or multi-format interface for installation in an equipment rack or presentation lectern. 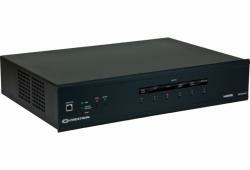 Additional DigitalMedia (DM) inputs and output allow the DM-MD6X1 to work with the full line of Crestron? DM transmitters, switchers, receivers, and room controllers, affording extensive capabilities for routing and distributing all of today's multimedia AV signal types throughout a single room or larger facility. Combining DM technology with a full complement of analog connections affords a perfect signal converter for integrating DigitalMedia into any analog-based system like Crestron MPS, QuickMedia?, and the CEN-RGBHV Series. Inputs on the DM-MD6X1 include multi-format BNC video, RGB, HDMI?, balanced line-level and SPDIF digital audio. The HDMI input supports HDMI with HDCP, handling WUXGA computer resolutions and 1080p60 HDTV with multi-channel lossless audio. The HDMI input can also handle DVI and DisplayPort Multimode signals using an appropriate adapter or dongle. The RGB input handles analog RGB signals up to WUXGA 1920x1200 pixels, as well as component video up to 1080p60. The multi-format BNC input also accepts component HDTV signals up to 1080p60, as well as standard definition NTSC/PAL composite and S-Video. Dedicated audio inputs include two stereo balanced line-level analog and one SPDIF coaxial digital. Additional inputs are easily added at locations up to 450 feet (137 m) away using DM Transmitters. Three CAT-type DM inputs are provided on the DM-MD6X1, accepting inputs from individual DM Transmitters as well as other DM switchers. A single DM CAT output is provided to drive a DM Receiver/Room Controller at the display location, or to feed another DM switcher. HDMI and analog audio outputs are also included to feed a local video display and audio system. The analog stereo output includes professional balanced terminals and programmable volume control. As the leader in HDMI and control system technologies, Crestron has developed DigitalMedia, the first complete HD AV distribution system that takes HDMI to a higher level, and allows virtually any mix of AV sources to be distributed throughout the home, office, school, or virtually any other facility. DigitalMedia distributes uncompressed digital video and audio signals up to 450 feet (137 m) using DM cable. DigitalMedia thoughtfully manages all of the different signals and devices, matching each source's output to the capabilities of the selected display(s) without using scaling or compression. Every signal is preserved in its native video resolution and audio format, ensuring a pure, lossless signal path throughout. Crestron exclusive QuickSwitch HD technology minimizes the annoying switching latency that plagues typical HDMI switchers. QuickSwitch HD achieves very fast switching of HDMI signals by maintaining a constant HDCP connection with each HDMI device in the system, eliminating the need to re-authenticate each time a different source is selected. The DM-MD6X1 also functions as a keyboard/mouse extender and switcher, allowing a computer or other USB HID-compliant host device connected to the DM-MD6X1 to be controlled by a keyboard and mouse at the display location using a DM-RMC-100-1 room controller, or at a presenter's location using select DM transmitters. The DM-MD6X1 allows for management of the EDID (Extended Display Identification Data) information that passes between the display devices and input sources in the system. Using Crestron Toolbox? software, the format and resolution capabilities of each device can be assessed and managed through the DM-MD6X1, ensuring reliable operation by instructing sources to output only the resolutions and formats that can be handled by the displays and system wiring. The primary objective of every Crestron system is to enable precisely the control desired for a seamless user experience. DigitalMedia provides an alternative to conventional IR and RS-232 device control by harnessing the CEC (Consumer Electronics Control) signal embedded in HDMI. Through its connection to the control system, the DM-MD6X1 provides a gateway for controlling AV devices right through their HDMI connections, potentially eliminating the need for any dedicated control wires or IR probes. Through proper CEC signal management, DigitalMedia allows you to take control of each device in the system as you like. The DM-MD6X1 is designed to be placed on a shelf or mounted in an equipment rack or lectern. The front panel provides basic operation right out of the box. User-friendly setup and troubleshooting tools are provided via Crestron Toolbox? software, performing automatic input and output configuration while letting the installer make intelligent design decisions along the way. The switcher even tests and measures the length of each DM cable, automatically making the appropriate calibrations for optimal signal transmission to each DM device. The DM-MD6X1 also affords a perfect signal converter for integrating DigitalMedia with analog-based systems like Crestron MPS, QuickMedia?, and the CEN-RGBHV Series. A simple HD15 VGA cable connected between the output of an MPS system and the input of the DM-MD6X1 allows every RGB, component, S-Video, and composite video input on the MPS to be converted to DigitalMedia. Analog audio is converted similarly through a simple balanced stereo audio cable. The DM-MD6X1's HDMI and DM inputs may also be used to expand the input capabilities of the MPS system to handle digital AV sources, and its analog audio output can easily be fed into any spare input on the MPS to allow the digital audio signals to be amplified and controlled through the MPS system.